Are you ready for another tasty recipe made from the baked chicken breasts? My mom came up with this one and it was an instant hit! The curry doesn’t overpower the salad because it simply adds just the right amount of kick! It is the perfect sandwich for a rainy day because being colorful and tangy, it brightens your plate! As unusual as it is, it stormed all day in Utah today! I love rain and thunder! This sandwich is perfect no matter the day of the week when it storms. So take a listen to “Call It Stormy Monday” sung by Nancy Wilson today. Enjoy! In a large mixing bowl, combine curry, cilantro, yogurt, mayonnaise, white grape juice, pepper, and salt. Dice chicken into bite-size pieces. Add to dressing and stir to coat chicken. Add onions, celery, and raisins. Right before serving, add almonds or cashews. 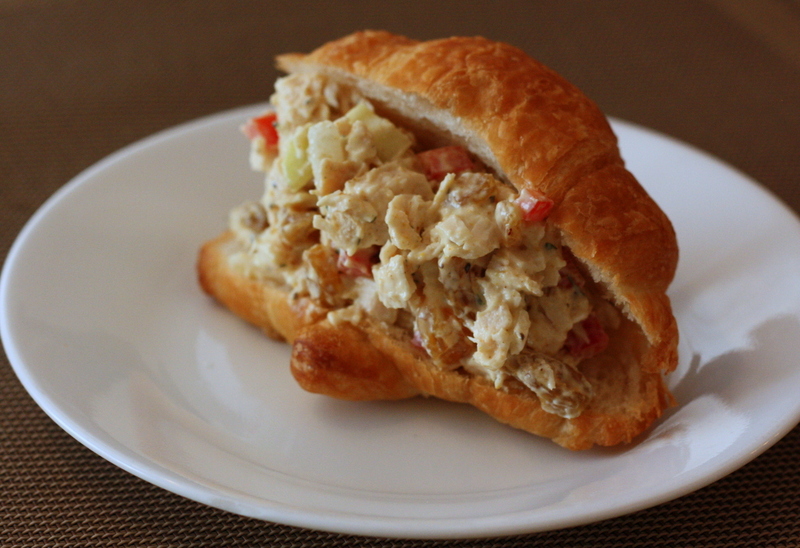 Fill croissants with curry chicken salad.